Kiwi batsman Martin Guptill was interviewed by his wife Laura McGoldrick after the 1st ODI where his 117 unbeaten took New Zealand over the line at Napier. 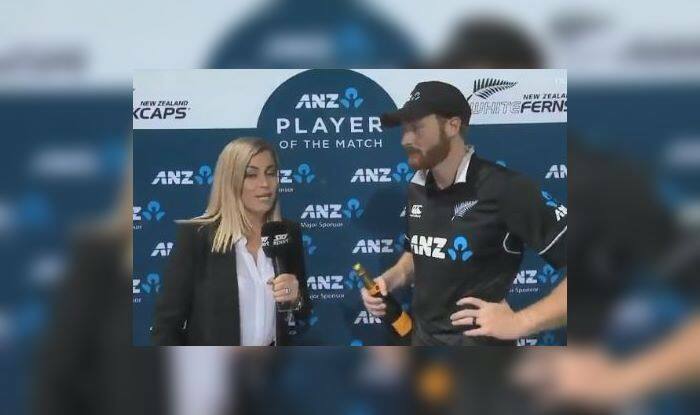 Kiwi batsman Martin Guptill was interviewed by his wife Laura McGoldrick after the 1st ODI where his 117 unbeaten took New Zealand over the line at Napier. Chasing 233 to win against Bangladesh, the Kiwis won the match by eight wickets with 33 balls to spare. It was a convincing win for them after getting thrashed by India 4-1 a couple of weeks ago. What caught our attention was Guptill being interviewed by his wife after the match, not a common sighting in cricket. But the two did not let the personal equation make things embarrassing, they were as professional as one can get. Guptill answered everything that was asked like a gentleman. Guptill reached the three-figure-mark in 103 balls. His innings was laced with four sixes and eight boundaries. “The most pleasing thing was how the guys restricted Bangladesh up front with the ball. Losing 4 wickets in the first 10 is really tough to come back from. It (his back) is going to be a bit stiff. It is nice to see the boys home. Sometimes yes, sometimes no (time off from cricket helps) it still didn’t feel fluent. At most parts, we talk to each other but he (Taylor) just lets me through as I bat longer,” said Guptill while speaking to his wife.